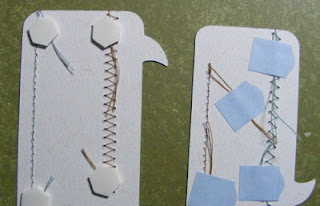 If the stitching is in the middle of the pages as on my scrapbook layout below "Some Creatures Are So Sweet," I use a needle to pull the threads to the back side and either tie off or cover with tape. 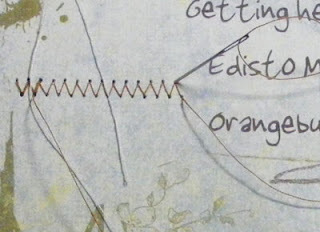 If the stitching runs to the end of the paper, I pull the threads taut on the reverse side and add either a dimensional or usually a photo split. Photo splits are made by Scotch. I buy mine at Walmart and use frequently for adhesive. They are relatively cheap and easy to control the application. The permanent ones hold well. 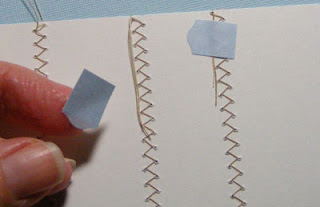 Plus because they have a peel off layer, you can apply a photo split and then peel and stick when you ready to finish your layer which is perfect for dealing with loose threads! You have the added bonus of already having adhesive on the back of whatever you are working on. Sometimes the basic stuff is really the best. Remember tomorrow is Veteran's Day in the US. It is a great opportunity to thank a veteran for their service to the country. 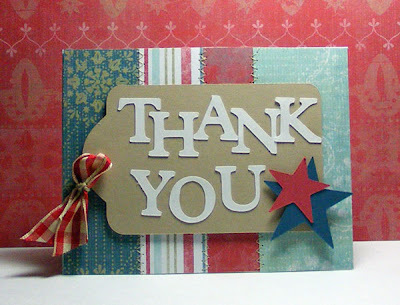 Ingredients: DSP: Western Sky by Stampin' Up!